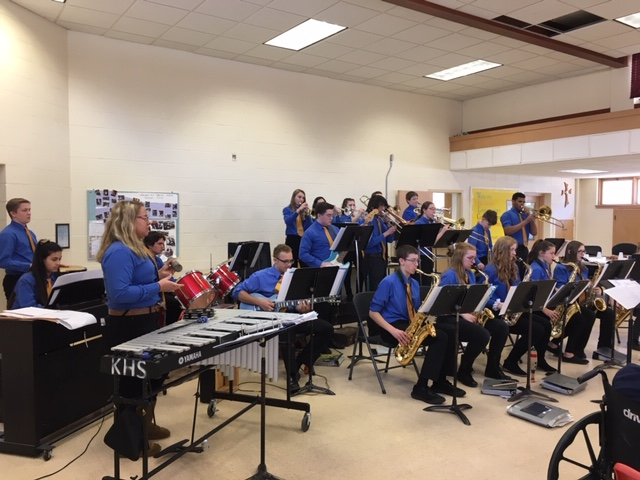 Kingsford Jazz Band led by Ben Sherk members are percussion from left, Lilly Menghini, Marcus Kuzranku, Murio Occhietti, Kiru Peters; front row from left, are Bryce Robinson, Logan Smith, Meryl Luoma-Maunista, Kate Cook, Katherine Erickson, Marli Smith, Alex Ketola, and Lydia Wilson; second row, Eli Sulin, Javon Hudson, Daniel Peterson, Ben Stanish, Ren Thorne, and Bryce Horwitz; back row, Kyla Gauthier, Kyle Kruppstadt, Ben Vercoe, and Derrick Sirovy. 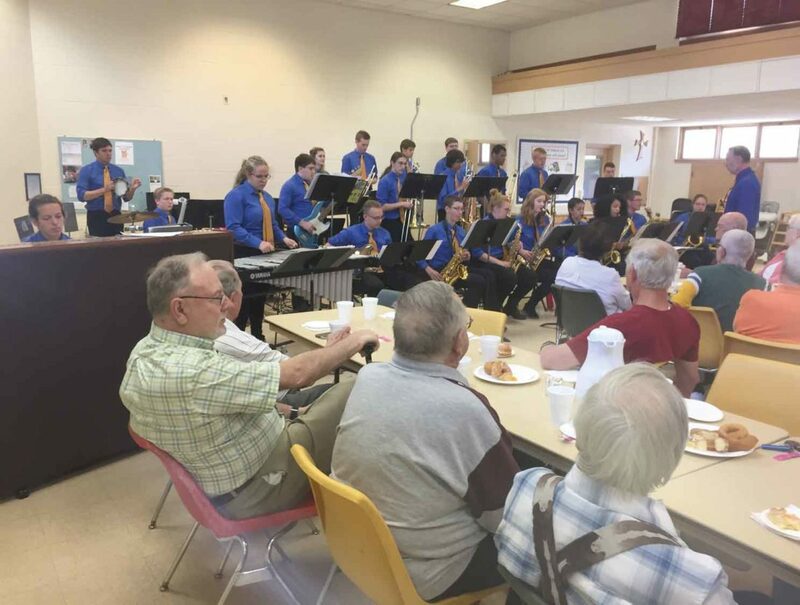 KINGSFORD — Golden K members were treated to a rousing performance by the Kingsford School Jazz Band under the direction of Ben Sherk at the May 14 meeting. Vance Uhazie opened the meeting and introduced Paul Ward, chairperson for the day, who turned the program over to Sherk. The band entertained with seven pieces, which included “In The Mood,” which Sherk joined the band for this number and a familiar number by Duke Ellington. 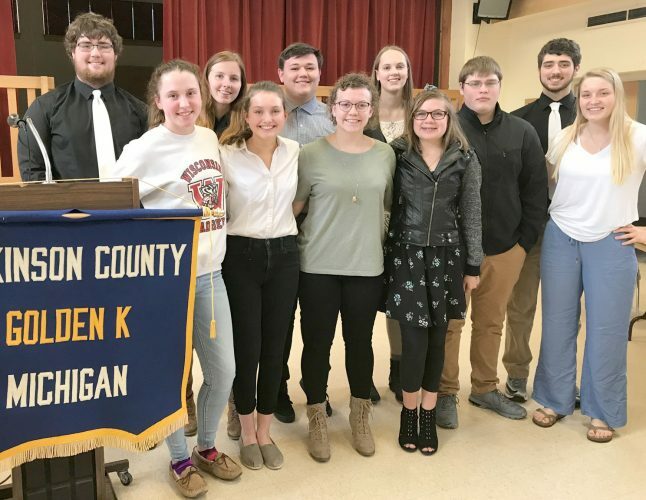 Soloists included Logan Smith, tenor sax; Daniel Peterson, trombone; Javon Hudson, trombone; Bryce Robinson, guitar; Kyle Kruppstadt, trumpet; and Meryl Luoma-Maunista. There are 22 members in the band and they practice two days a week before school from 6:15 to 7:30 p.m., which shows their dedication and hard work. Only a few are seniors and they will be replaced through tryouts shortly. Enough students try out to make it possible even have another group. It was a great performance and a great start to the day. The meeting concluded with announcements of Golden K activities. Gil Engel reminded about road pick-up after the meeting. Golden Throats sang on May 16 at Freeman’s, and will on May 23 at Evergreen Estates. Jeaninne Polkinghorne won the 50/50 drawing. The next meeting on Monday will welcome Kingsford High School Chorale. There will not be a meeting on Memorial Day. The children’s picnic will be May 29 at City Park in Iron and Mountain.